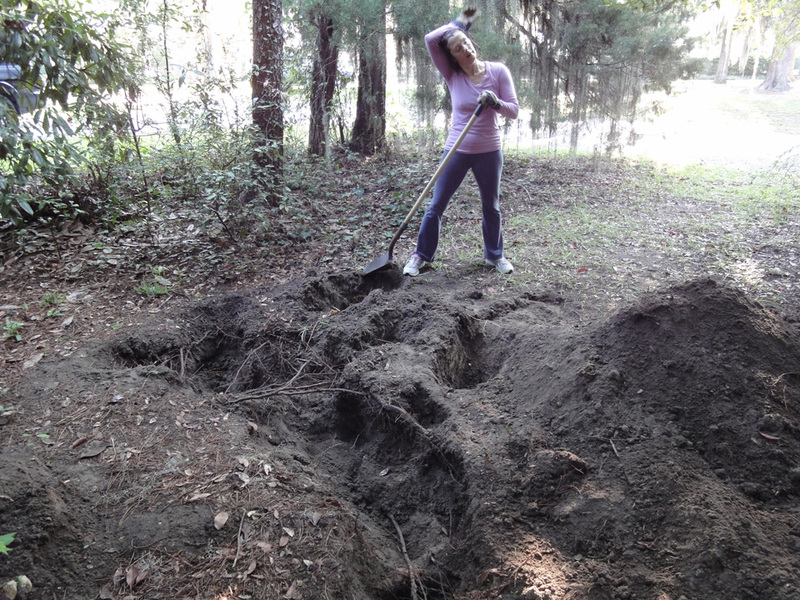 Exhuming a body – of work « "TeresaBruceBooks"
I knew it was only a matter of time before the neighbors wondered about the dirt piling up in the woods beside our house. But I should have guessed our defense-attorney neighbor, Scott Lee, would be the first to comment. “How tall you figure Gary for?” he asked, on an afternoon stroll with his daughter. “Oh nothing. That grave you’re digging seems plenty long enough to bury his body by now,” he said. He’s right. I’ve been at it for a week and the trench that started it all is now surrounded by enough holes and offshoots to hide a dozen bodies. But it’s a body of work I’m digging for – one that I’m desperate to unearth.You see, Duncan Miller’s unpublished manuscripts are somewhere in the soil behind our shed, between Wilson Drive and the house where he and Byrne once lived. I know because I buried them there. Gary actually did the original digging, but he can’t remember exactly where. Neither can I – we were both in too much of a hurry to get the books in the ground to bother marking the spot. All we’re sure of is that we wrapped three thick bundles of manuscript pages in layers of plastic lawn bags. Picture a stack of telephone Yellow Pages wrapped in black plastic and you’ve got the approximate size, density and shape of our buried treasure. How far down? Well that’s a mystery too – we were shooting for deep enough to deter dogs and that’s as scientific as it got. It all seemed like a logical plan two or three years ago – we can’t even remember exactly when we buried the books. Byrne Miller – the woman whose life I’m writing a book about – spent a lifetime trying to get them published. She kept them under her sofa in bankers boxes and saved – I’m not kidding – hundred of rejection letters. I had just started to get rejections of my own – New York publishers not being interested in the story of a not-world-famous dancer and her writer husband – and it felt like bad karma. Gary made a bonfire and we burned the bitter letters of Duncan’s defeat but I couldn’t bring myself to destroy the work itself. They represented a lifelong endeavor and I felt Duncan’s pain. So I read through the manuscripts and culled a beautiful poem from the pages of his many drafts. As luck would have it I found a wonderful publisher in Charleston who loved the poem and the story of the marriage it represented. We planned for the poem to be an epilogue of sorts – a way for Byrne to finally get Duncan published. You can read the poem if you dig – I mean scroll – through enough earlier blogs on this site – it’s in there somewhere. Gary and I figured if we buried the manuscripts, like a time capsule, maybe someone would unearth them in another lifetime and find them bizarre and antiquated enough to print. But now, months into the editing process, it’s becoming clear that Duncan’s disturbing, unpublished novels are essential to Byrne’s story. The poem isn’t enough. I have to exhume the manuscripts. So far, we’re coming up with lots of oyster shells and shovel-stopping roots but nothing else. Next week we’re going to try to find a pointed metal stick to use as a probe. 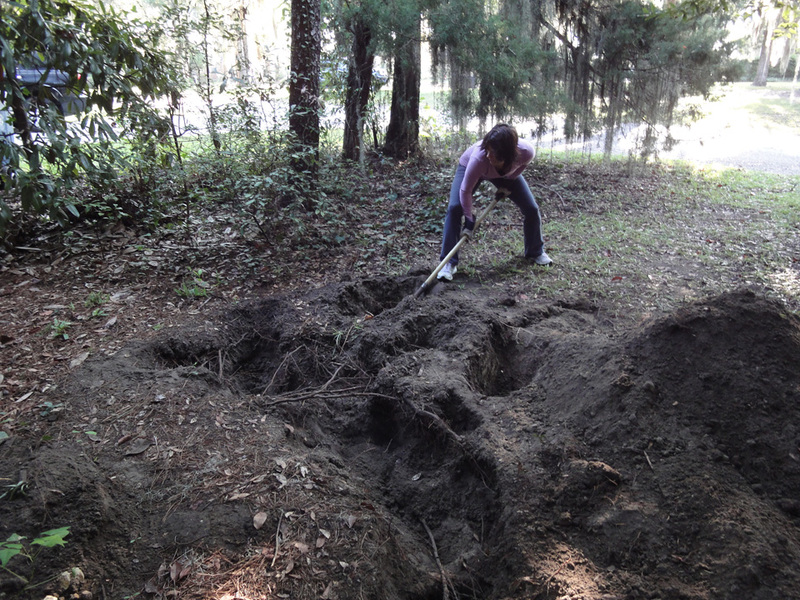 Maybe that’ll look like I’m just aerating the soil, instead of preparing a mass grave. But then again, it is approaching Halloween….. Hmm. Stay tuned. This entry was posted in travel and tagged writing. Larry says to call if you want professional help digging for artefacts. He also does own a probe rod.